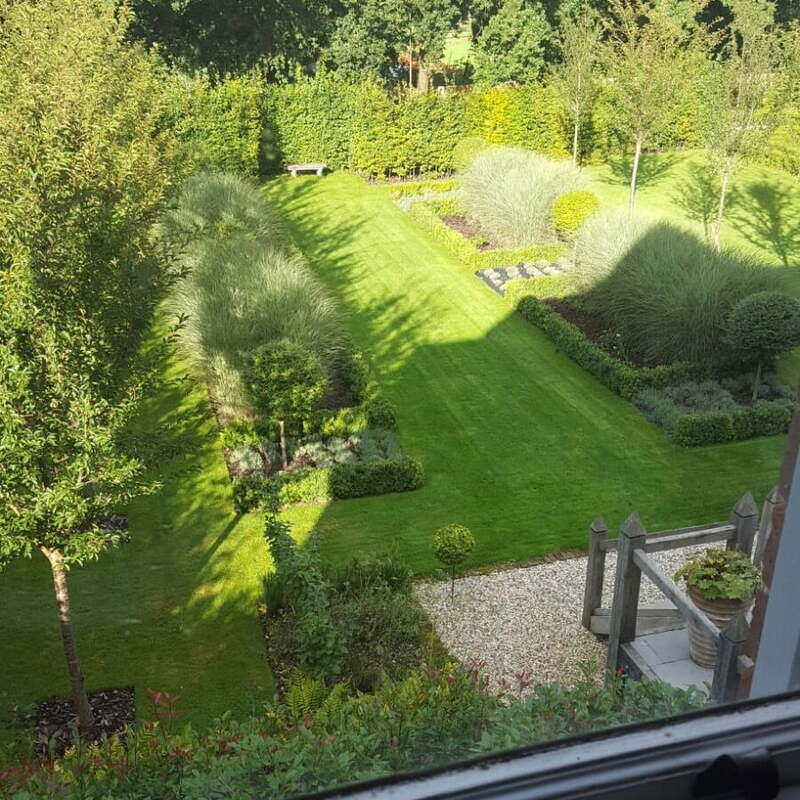 Home » Behind The Scenes » Designer garden for sale! 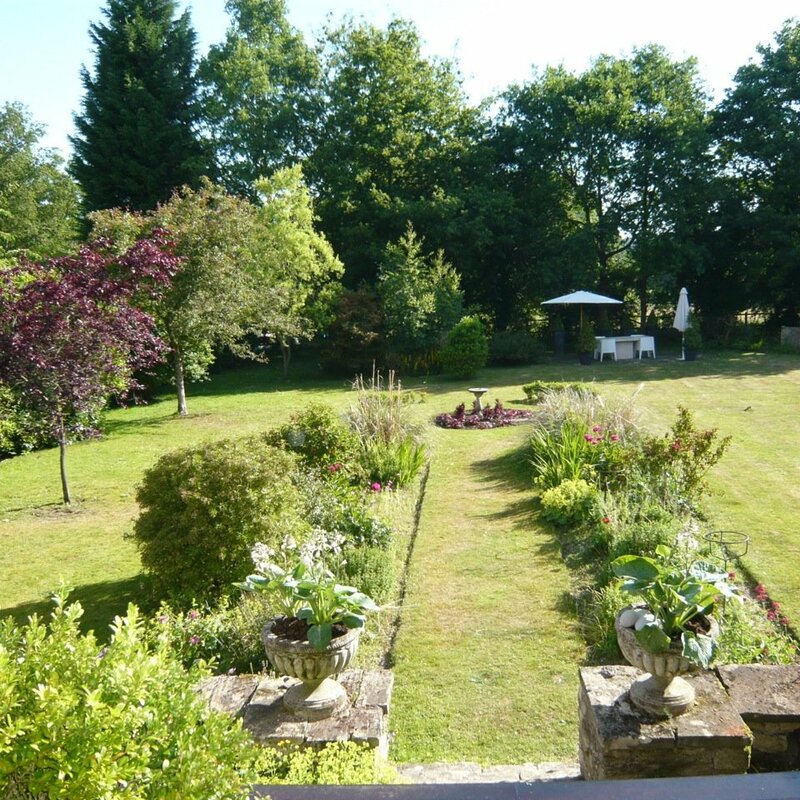 Here’s the heads up – we’ve decided to sell our beautiful large house & garden. Yes, the time has come to be moving on to a new project. 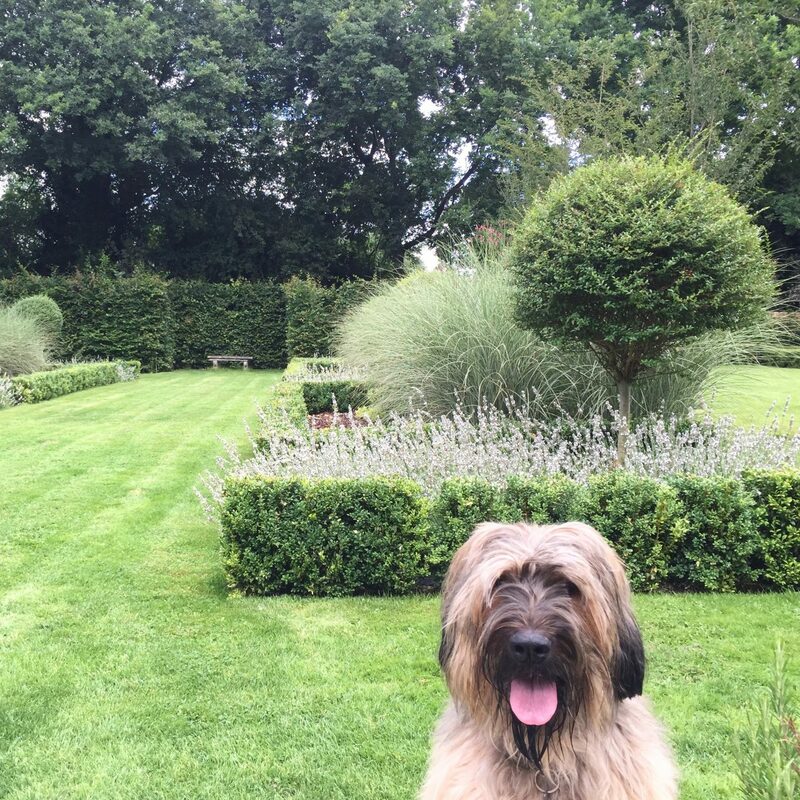 I normally stay around 5 years so it’s a bit of a record to have enjoyed 7 years doing up our large Victorian house & garden here in Berkshire. 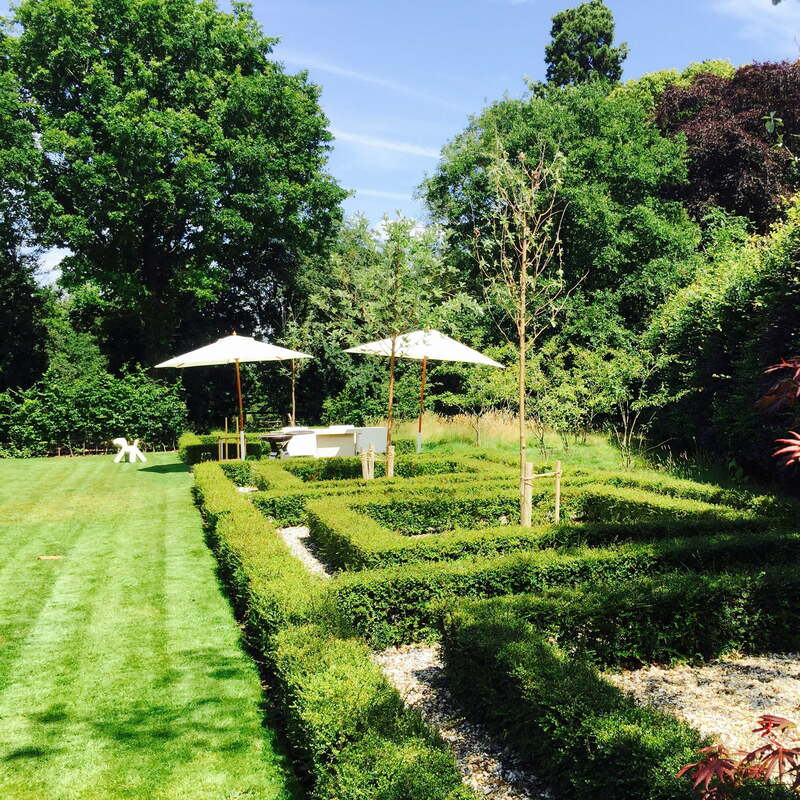 The garden has been transformed from a seriously awful mess with sheds & island beds galore, into a very simple & stylish formal garden to suit our Victorian house. If you’ve read previous blogs of mine you will have followed its progress which has been hard work but very satisfying. All you can see here other than the mature oaks at the rear has been planted by us & our great help – Oneil who is as strong as an ox & the hardest worker I know. 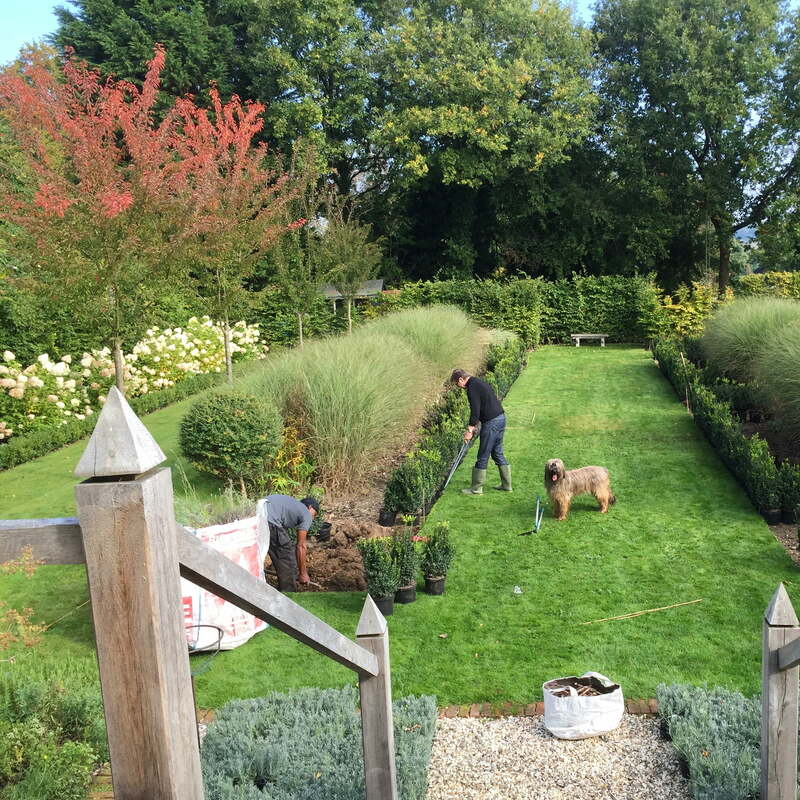 Here he is below working in 2015 on the large central beds with my husband. Helped by Charlie our dog of course! 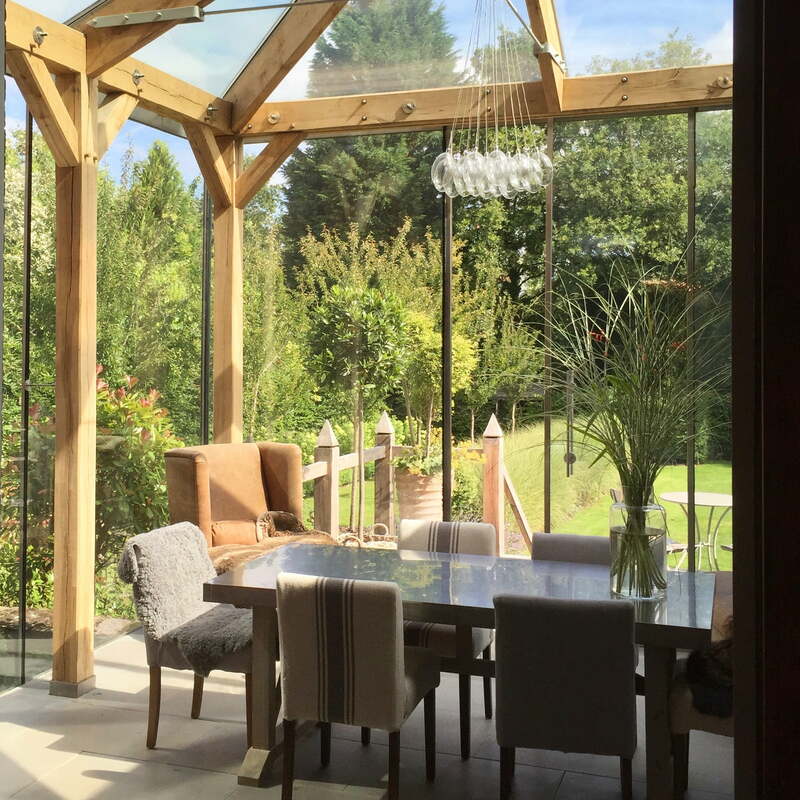 We added this green oak extension in 2014 which we love. It’s been great to sit & dine inside out! 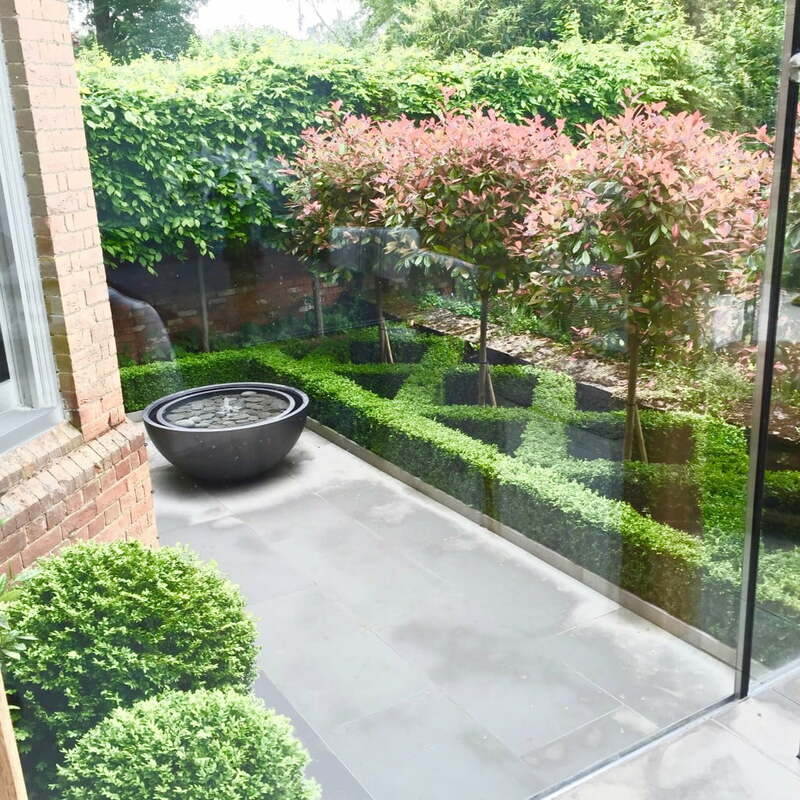 Super too to look out onto the smart courtyard beside it which when lit at night is just lovely. I’ve used the same stone flooring for both for continuity. 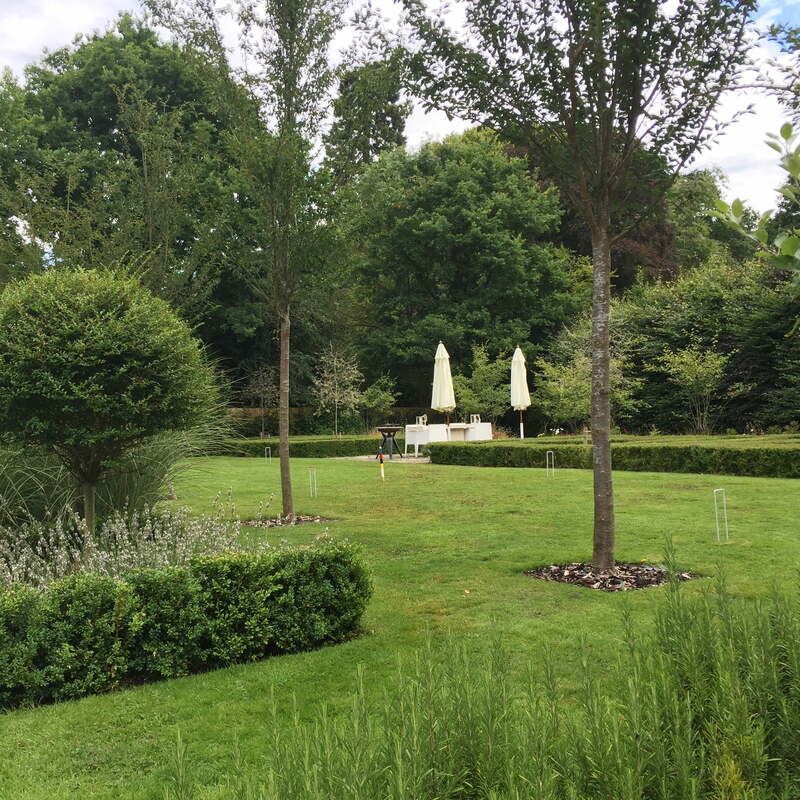 For summer dining we sit amongst the clipped hedges of the parterre beside the multistemmed amelanchier trees in the mini wild flower meadow. I’ve planted whitebeam trees in the centres which are still very young but will look fantastic in years to come when they have full fluffy heads of silver foliage. Always bold, my planting here is simple & dramatic. 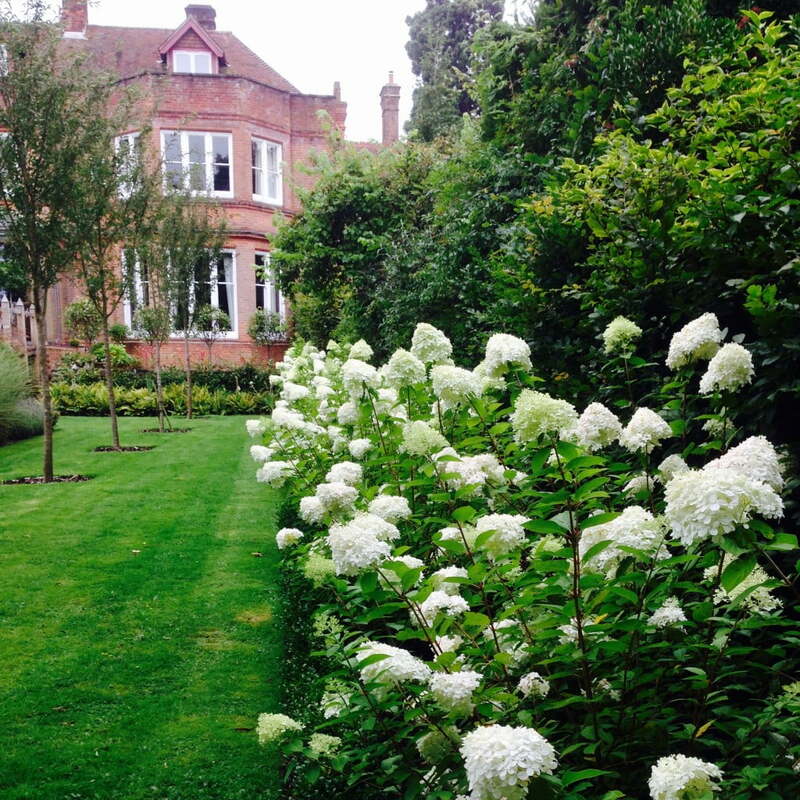 These hydrangea limelight run the length of the lawn. They are fantastic value as they flower well past summer & are strong enough to hold their heads up high without any drooping. 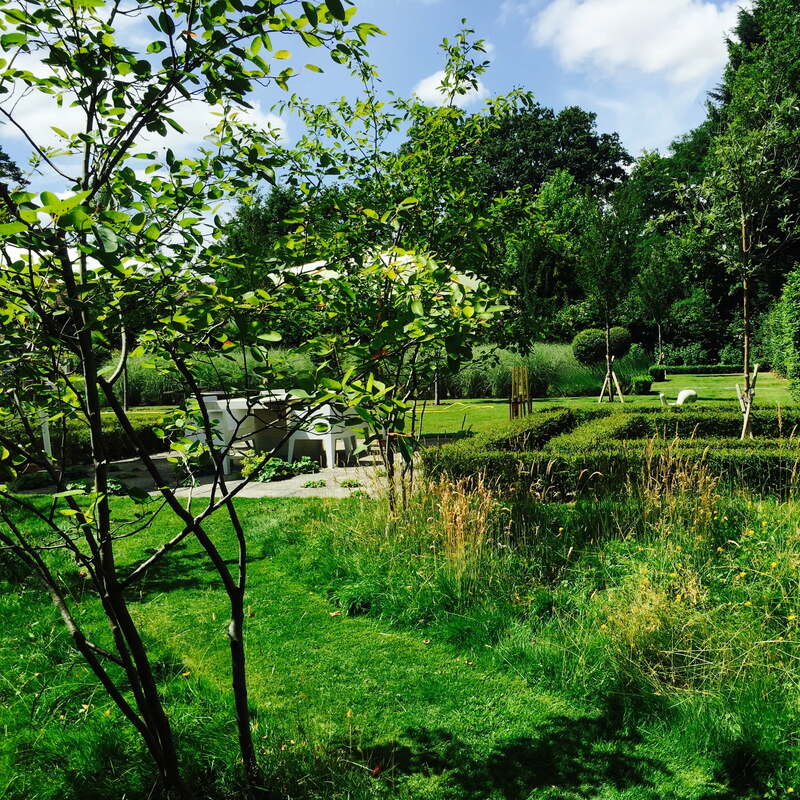 Throughout the winter they, together with the topiary & grasses, add structure & architectural interest. This shot was taken a few years ago before we painted the windows a smart grey. 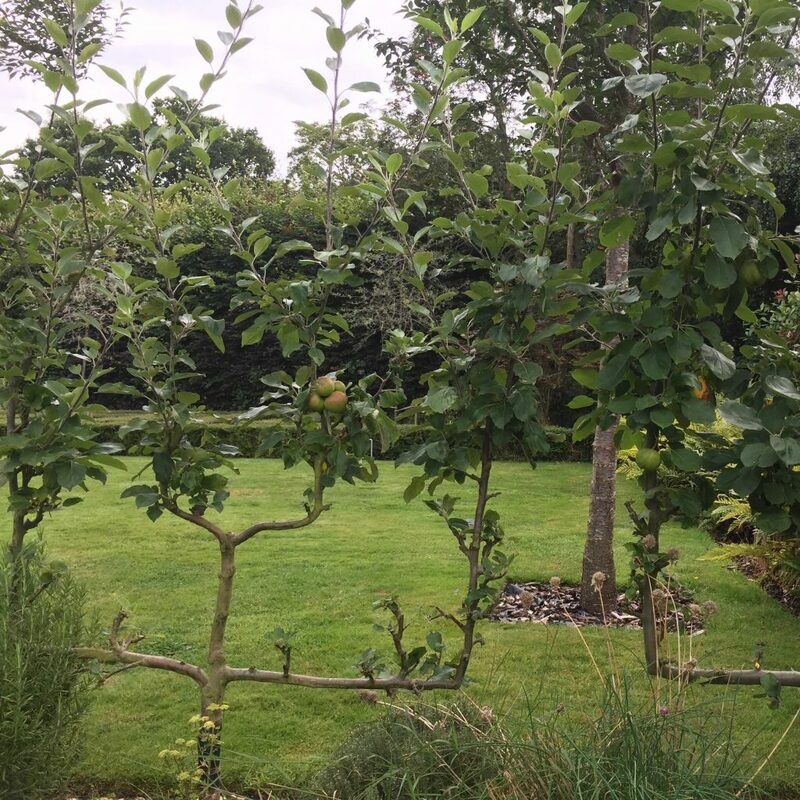 Here’s one of our 4 candelabra apple espaliers. I just love these! I saw them years ago in France & now you can buy them here. We have 4 flanking 2 herb beds near the kitchen for quick access as required. I will miss it but I do love a new project! Look at what we started with! This was our garden when we bought it – YUK!! This morning on March 21st 2017 I took this of the garden finally coming back to life after a long & dreary winter. 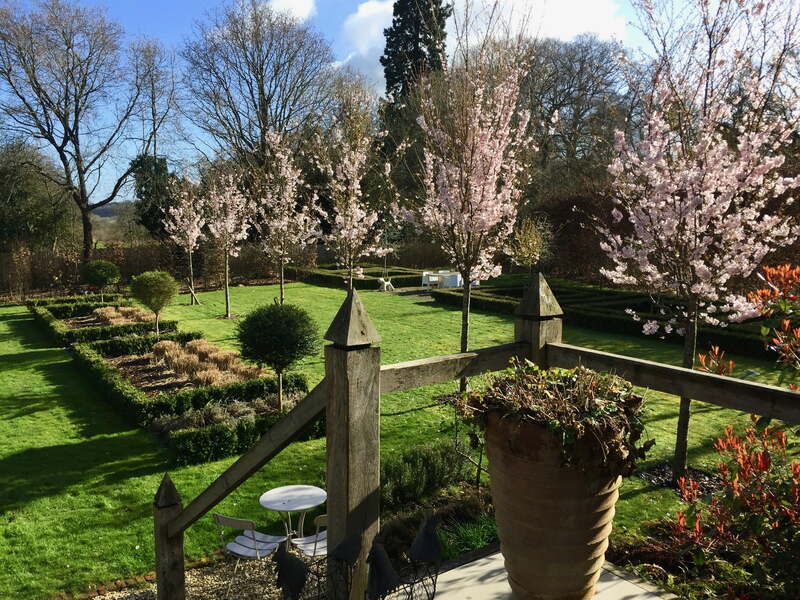 The cherry trees are in blossom & the amelanchiers in the distance are full of huge buds so will look terrific soon too. 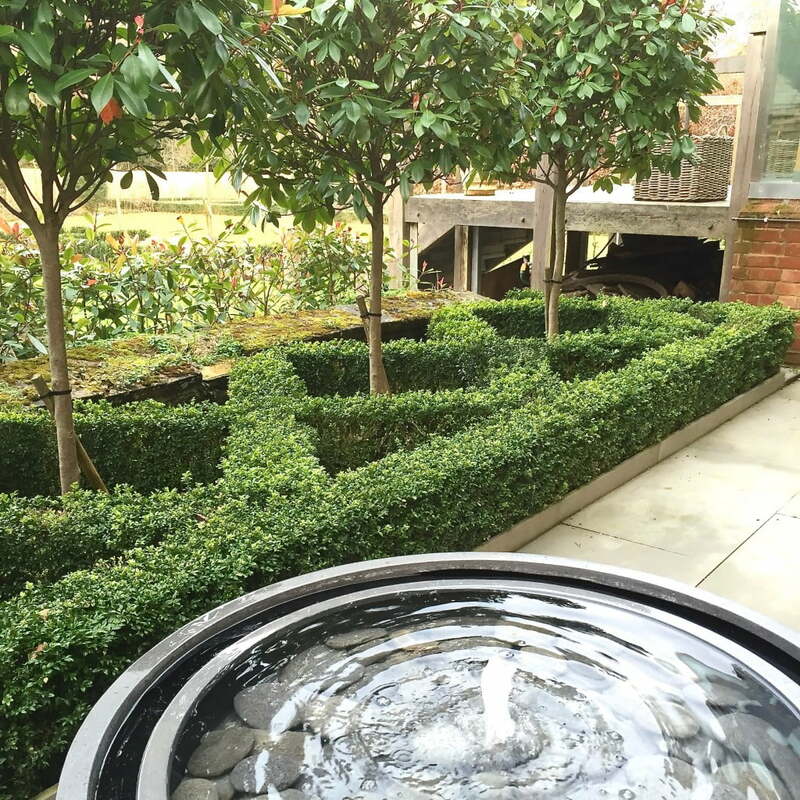 I may replicate some bits in our new garden (not far so don’t worry if you are a client!) & you can follow progress there when we get started. It’s obviously a tad naked at the moment but if you are interested it is being marketed by Matthew at Savills in Newbury.